When I learned how to make blue cheese salad dressing I found it has more of its own unique smell and flavor over other salad dressings. There is no “just liking” this dressing. For the people who like this salad dressing recipe, they love it and it is almost always their choice for dressing. Blue cheese carries a distinct smell. It is aged in a temperature controlled environment and can be eaten by itself or crumbled in salads and other foods if you know how to make salad dressing. You will find when learning how to make blue cheese salad dressing it has a sharp and salty flavor from the cheese. This cheese is reported as having been discovered by accident but its unique flavor has made a flavorful impact on many people around the world. After being stored in caves, the natural environment of the cave caused harmless mold to grow on the cheese producing this wonderful flavor that so many love. If are learning how to make blue cheese salad dressing, there are many different types of blue cheese. There are many different “brands” that simply go by the name blue cheese. The blue cheeses of Europe are protected by the “destination of origination” law. This means they must carry the name of their origination and other cheese cannot claim that name. Below are a few of the most popular of these semi soft blue cheeses and from where they originate. Well known Roquefort Cheese originated in France, where it is made with sheep’s milk and ripened in the famous caves at Roquefort. Roquefort type cheese and the similar Bleu or blue cheese are now made extensively here in the United States. Roquefort cheese is a slightly moist sharp tasting white crumbly cheese with veins of green running through it. The odor and flavor of this French cheese makes it one of the most popular blue cheeses even here in the United States. Mentions of this cheese have been made since ancient times. The famous Stilton Cheese of England resembles Roquefort. It is made in a white and a blue cheese. Both the white and the blue cheeses have a strong odor and taste but the blue is the most well known. Like the other blue cheese, it has a characteristic blue green veins running through the cheese. Gorgonzola Cheese is an Italian blue cheese made from cow’s milk. It is buttery, firm, crumbly and is salty. Like the others it has a blue vein running through the cheese and has a sharp distinctive characteristic taste. In a mixing bowl on low speed blend together the sour cream, dry mustard, black pepper, salt, garlic powder and Worcestershire sauce. Add the mayonnaise and blend until smooth. Crumble the blue cheese by hand and add to the mixture. Blend again on low speed for 2 minutes. Combine the oil, vinegar, sugar, dry mustard and garlic powder; mix until well blended. Add the blue cheese and blend 1 minute. Prepare the dressing the day before needed. Combine the blue cheese, mayonnaise, buttermilk, onion juice, Worcestershire sauce, hot pepper sauce, steak sauce and garlic and blend well. Stir in the salt and garlic salt. Combine and blend all ingredients; refrigerate until ready to use. To serve pour over 1 pound finely shredded cabbage and toss to coat. Combine and process in blender all ingredients for 2 minutes EXCEPT bleu cheese and mayonnaise. 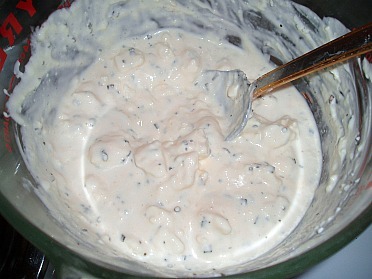 Add mayonnaise and blend for 2 minutes; crumble and add bleu cheese and process about 3 minutes. Refrigerate 24 hours before serving.